Worried about cracking your smartphone screen? Some interesting new smartphone designs from Samsung could be to the rescue. The U.S. Patent and Trade Office recently published Samsung’s request for a patent on new folding and scroll-style smartphone designs. Either of these designs would be significant innovations for smartphone displays, which continue to be dominated by square, flat designs. For the folding phone, you would have access to a screen even when the device is folded (unlike a flip phone), and then you could access more detailed commands once you open it up like a book. Samsung’s patent filing also discusses another exciting new design that where the phone could roll up and unroll like an ancient scroll. The development of bendable, foldable and rollable-smartphone displays has been rumored for years. After all, Samsung promoted a concept video on a clamshell-style device on YouTube all the way back in 2013. But this patent filing provides hopeful glimmers that an outside-the-box smartphone display will make its way into the hands of consumers. 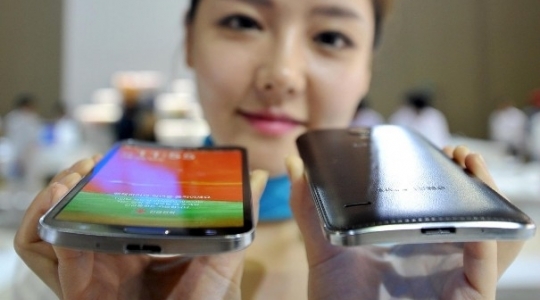 Samsung already broke ground by creating the Galaxy Round, the first smartphone with a curved display. Perhaps even more exciting designs are on the way.